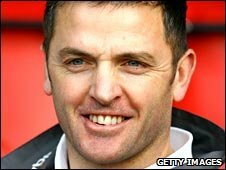 Former Southampton defender Jason Dodd has been appointed caretaker manager of Aldershot Town. Dodd's temporary appointment follows the departure of former Aldershot boss Gary Waddock, who was named Wycombe Wanderers manager on Tuesday. Dodd told BBC Surrey: "We don't know how long it's going to be but, for a short-term period, we're going to enjoy it and work hard." Dodd, 39, made 399 league appearances for Southampton during a 15-year spell. In 2007 he returned to Saints as first-team coach under George Burley, after leaving his post as Eastleigh boss. Dodd was then appointed Southampton's joint caretaker manager alongside John Gorman after Burley took over as Scotland coach in January 2008. Dodd added: "I've been itching to get back in and this is just a fantastic opportunity to come down and put our stamp on it." The former Saints player will be assisted by former team-mate Paul Williams as Aldershot search for a new permanent boss. Their first game in charge will be Saturday's home League Two match against Bury.